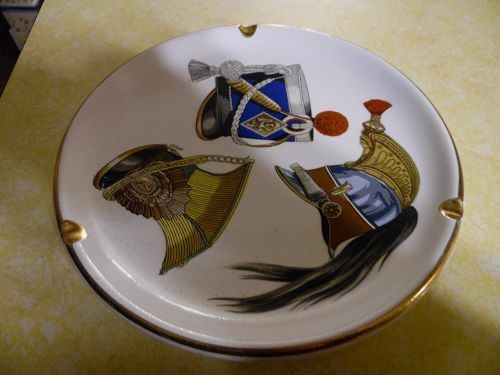 Large Swank Militaire Helmets Gold Rim Ashtray 9"
Nice large 9" collectible ashtray for your collection of smoking memorabilia. Made of ceramic with gold trim. Three vintage style military helmets in the center of the ashtray. Perfect condition with no chips or cracks. Original foil sticker on the back. Looks to have never been used as an ashtray, only displayed.